It's the third time this year we've surveyed the Johannesburg to Durban flight route and each time Nationwide Airlines has offered the cheapest flight. Nationwide Airlines flight 442 leaves Johannesburg on the 14th September at 1835 and arrives in Durban at 1945; the flight costs R409. Nationwide Airline has had the cheapest flight price in all our past surveys of the Johannesburg to Durban flight route. For the record, here is the history of Nationwide's flight prices as compared to the average flight price on the route. We can also see from this that an expensive time to fly from Johannesburg to Durban is in the June holiday period, when average flight prices are some R300 more expensive than the rest of the year. 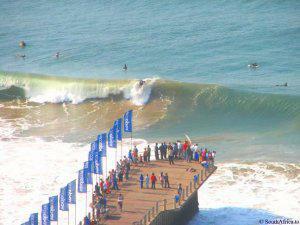 So, if you're planning on going on holiday in Durban in June 2008, book early! (the same principle holds for holidays in the rest of South Africa). Etihad Airway's flight from London on the 28th November and the return flight from Johannesburg to London on the 19th December 2007 is the cheapest at £465. SAA has announced that they are no longer going to be serving alcoholic beverages before noon, as they "believe it is inappropriate to serve alcohol on morning flights" - according to SAA's morality it becomes appropriate to booze at noon. Which begs the question - will Manto be switching to 1Time Airline for her morning flights? For those who enjoy consuming alcohol, "SAA will continue to serve a full bar service after 12 o'clock". Facebook users might be interested in joining the group we have started there called "South Africa cheap flights". We review Mango Airlines on this flight from Cape town to Johannesburg, and vow we'd rather pay extra to fly with 1Time, Nationwide or Kulula than climb into the Mango can again. On a flight from Johannesburg to Cape Town, we compare 1Time airlines to Mango Airlines. We compare Avis and Hertz's Johannesburg airport outlets, and how their knowledge regarding car babyseats shapes up. While both Avis and Hertz are pretty clueless when it comes to delivering the correct car babyseat (different age babies require different size seats), Avis beats Hertz to the bottom by a short head. 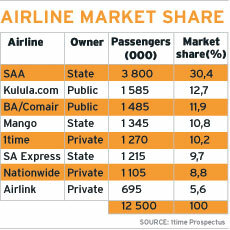 In this article, the Financial Mail has a look at the South African airline industry and its main participants - 1Time, Kulula, British Airways, South African Airways, Nationwide, Mango Airline, Airlink and SA Express. While much more swanky than the Holiday Inn, the Melrose Arch Hotel is seriously lacking in certain areas (although it does have awesome pepper grinders!). We review the Melrose Arch Hotel, and see how it shapes up against the Holiday Inn Garden Court (in Sandton). SAA subjects Ugandan minister to new form of "apartheid"
Uganda's economic monitoring minister, Maurice Kagimu Kiwanuka, claims that on a South African Airways flight he was the victim of a new form of “apartheid; shocking, crude and embarrassing! All the passengers were sprayed as if they were carrying bedbugs or lice. To me, this is a new form of apartheid created by these people to mistreat others. We don’t carry bedbugs to be sprayed.” Hmm. Clearly nobody has explained to the Ugandan minister that spraying a plane is standard practice for all international flights. A man went into cardiac arrest on board SAA flight 316 from Cape Town to Johannesburg, which left Cape Town at 0838 on Saturday the 11th August. Two passengers with medical backgrounds assisted the man, probably saving his life. "We saw this man, he stopped breathing and started gasping for air. Then he went pale. We thought he was going to die." Thanks to some input from a reader, "George flights!!! ", we have updated our web pages for flights from Jeddah to Johannesburg and flights from Dar es Salaam to Johannesburg. We have also refreshed our webpage which helps you get onto a cheap flight to Johannesburg. SAA's first flight from Johannesburg to Libreville (Gabon) is leaving Johannesburg on the 19th September 2007. On Saturdays and Wednesdays, SA086 leaves Johannesburg at 17h00 and lands in Libreville at 21h05; the flight from Libreville to Johannesburg (SA087) leaves Libreville at 09h20 and lands in Johannesburg at 15h25 on Thursdays and Sundays. In our last survey of flights from Johannesburg to Cape Town, we were surprised to see that the Kulula flight from Lanseria airport turned out to be cheaper than any flights from OR Tambo Airport (partly because of the lower airport taxes). Then last week LAM announced that it would be operating its Johannesburg to Maputo flights from Lanseria Airport. 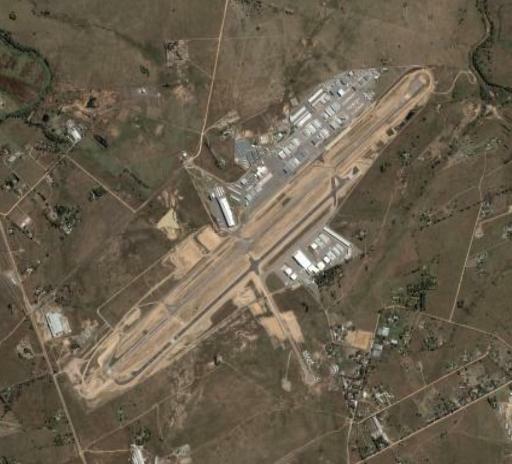 We needed no further encouragement, and have set up a dedicated webpage for Lanseria Airport. Busses are cheaper than planes again! In our latest comparison of travelling costs from London to Paris , the National Express (a bus service) offered the cheapest trip from London to Paris, with a British Airways flight coming in second cheapest. We have expanded our flight routes to cover flights from London to Brussels (Belgium), flights from Manchester to Newquay (Cornwall, UK), flights from Manchester to Plymouth (UK), flights from London to Plymouth (UK) and flights from Manchester to Bristol (UK). In February, the UK's Office of Fair Trading issued a warning gainst 13 airlines which did not include all costs, such as taxes, in their advertised flight prices. As a result eleven airlines have changed their pricing to include all costs (bmibaby, easyJet, Flybe, flythomascook, Germanwings, Globespan, Jet2, Thomsonfly, Monarch, Sky Europe and Wizz Air). And back in South Africa we have Kulula.com turning the clock back - they used to display flight prices inclusive of all costs, but have recently decided to exclude airport taxes (other culprits of this practise are South African Airways and Interlink). Now where's the South African version of that UK Office of Fair Trading? A Flybe flight from Birmingham to Belfast was struck by lightning, and forced to divert to Manchester Airport. "Flybe confirms that an aircraft was struck by lightning after take-off from Birmingham. As a precaution, the plane which was bound for Belfast was diverted to Manchester where it made a routine landing. Passengers were transferred to another aircraft to complete their journey to Belfast. The lightning strike did not damage the aircraft, which underwent a thorough inspection and there was no danger at any time to passengers or crew." "Business books are bullsh1t and are usually written by w*nkers." Michael O'Leary - the man in charge of Ryanair flights - full name, Michael Gerard Joseph Mary O'Leary. If it weren't for the fact that he heads the world's most succesful low cost carrier, it would be difficult to believe a man who's name is "Mary". The quote comes from Michael O'Leary's biography by Alan Ruddock, "A Life in Full Flight: The story of the man who made Ryanair take off".